This post is part of my special HAVE KIDS, WILL TRAVEL series to give you advice and wisdom on traveling with kids along with some reviews of travel-friendly items. One of the outtakes from our portrait with the grandparents. I should submit this to Awkward Family Photos. 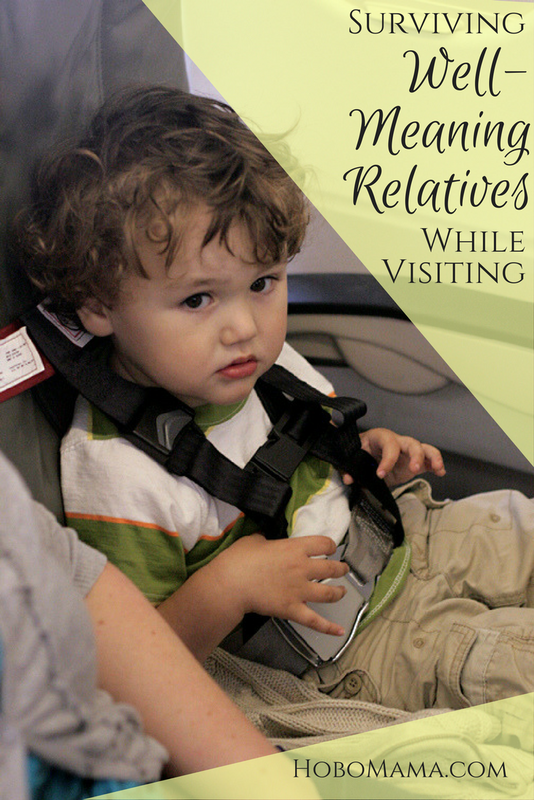 When we were recently visiting family this summer and fall, I wrote down some notes about awkward situations and uncomfortable interactions that might help you in your own visits with family and friends — whether at home, over the holidays, or traveling. This is a list of negative interactions, which is not to imply that visits with other people are to be feared or avoided. I hope there will be mostly bright moments as you witness your children attaching to the people who matter most to you, but this is a list that might help protect you against the scattered storm clouds that threaten your peace — and your parenting ideals. Your child will rub up against attitudes and parenting styles that are different from yours. This always irritates me a little, but I console myself that his time spent with these people is very brief compared with the time he spends with Sam and me — so our style will win out in the end, through sheer repetition. On our latest trip, Mikko started telling us all, "Great job!" in an exact parroting of a male relative. I know it's a common cultural construct that we personally have chosen not to indulge in; we try not to praise Mikko in order to signal our approval or to interfere with his own satisfaction and appraisal of a task. When first this person started telling him "Great job!" for something like carrying a plate to the table, Mikko looked nonplussed and slightly as if he knew he was being patronized; later in the week, he came to expect it. So it annoys me, but I trust that things like this will wear off when we go back home. One day after we got back, Sam had him in his car seat and I came down to the car a bit later. Mikko watched me walk up and told me, "Great job!" as I entered the car. This shows me that at least Mikko has no idea what it really means; he thinks you just say it randomly to people all the time, as the relative seemed to do to him. Your child will behave differently. This is true for Mikko whether he travels or people visit him at our home. It doesn't matter how low-key we try to make the visits, either, and how little we try to disrupt his routine. He will be disrupted, and his reaction is ever and always to become super giddy for several days, refusing to sleep for all but a few essential hours each night, and then crash in tears and tantrums and, finally, rest — at which point the cycle begins over again. I imagine some children who travel take the opposite tack of becoming withdrawn and quiet, particularly if they're shy and lose energy through the stress of interacting with other people, especially those who might be strangers to them. 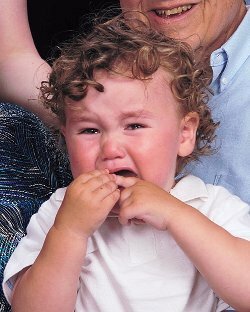 Your child might also break down more often over things that would not normally induce tears. Posing by an appropriate sign toward the end of our first big trip with baby Mikko. He was done. Mikko crashed out in an entirely unexpected nap at the dinner table during a family visit. than a word or grunt at a time, race around the table at mealtime, and fling borrowed toys across the room; he's less likely to want to sleep or cuddle or calm down for even a second. 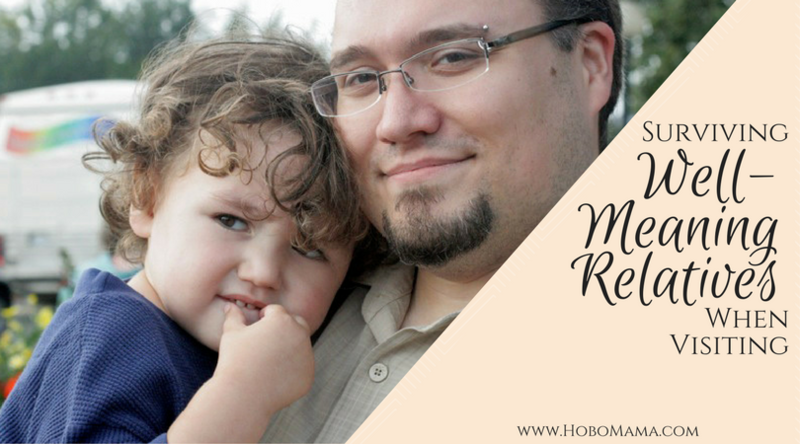 It's frustrating for Sam and me, both because he becomes someone we have little experience with dealing with and because our parents are standing there judging Mikko (and our parenting skills) based on the behavior he shows under duress. The only advice I can give: Expect this. Try not to let it get it to you (easier said than done). Tell the people you're visiting with as often as you need to for your own comfort how oddly your children are behaving, how stressed travel or visitors make them. Try not to blame your kids for their response to stress, and try not to take it personally when people who cannot understand that the behaviors are stress-based question your parenting. If they're your parents, probably they didn't make much allowances for your stress levels growing up, either, and you want to do better by your children, right? Of course, some children are more sensitive to change than others, and some thrive on variety and are future adventurers and travelers on their own; if you have (or are) one of the sensitive ones, try to be gentle and understanding — of them and of yourself. Your child will be pushed to behave in ways that are different from usual. For eating, one grandmother might encourage all manner of junk food, offering cookies and cake instead of meals, and another might forbid it, frowning if your child has a sip of caffeine or taste of sugar. Both Mikko's grandmothers like to make up rules about what can be eaten when, and where: Food at the table only (not a bad rule in itself, mind you, but not what Mikko — and our couch and carpet, heh — are used to! ), no sweets before a meal, no snacks too close to eating, a "proper" breakfast, etc. We also have issues with what other people allow Mikko to do when visiting or being visited. He's frequently cautioned against or straight out not allowed to pick up or explore breakable or expensive objects (even everyday plates and glasses), contrary to how he can behave at home. At one place, TV might be ruled off limits, and at another, offered as the go-to babysitter. Mikko frequently doesn't like to get dressed or undressed, or to bathe; usually Sam and I take the path of least resistance, letting him sleep in comfortable clothes, keep his jammies on all day, and wait until a bath sounds like spontaneous fun to him. Rather than strict ideas about what sort of schedule a child must be on and when naptimes and bedtimes must fall, we take a more freeform perspective. Such allowances can seem like over-permissiveness to grandparents or others who parented differently. It can be hard to keep a semblance of your own routines and regulations (or lack thereof) going in the face of disruptions combined with opposition. 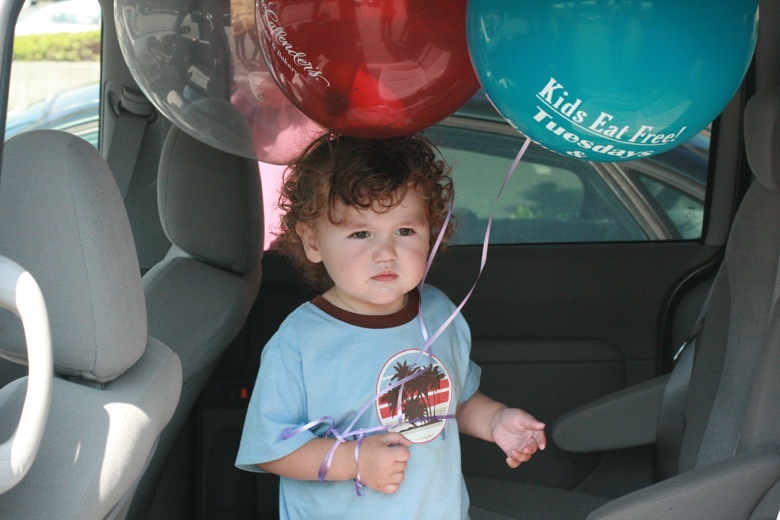 After we let Mikko steal all the balloons at the restaurant in an effort to continue eating in peace. The photo just prior to the banana spewing. We were too busy laughing and grabbing towels to capture the volcanic moment. fed purees. Because he had no food allergies, I stepped back and let them have at it. The end result? Projectile vomited banana all over my poor dad, who was holding Mikko. Plus, a fresh understanding for my mother that maybe Sam and I knew what we were talking about when we had said it was a bad idea. There have been other times we've stepped back and let them experiment, however, when we've regretted it, such as when it's a moment of discipline. For Sam and me, we remind ourselves that we get to decide to help our child calm down rather than punish. So choose your battles wisely, and remember that you're the parents and you have the privilege and responsibility of trying to choose what's best for your child. 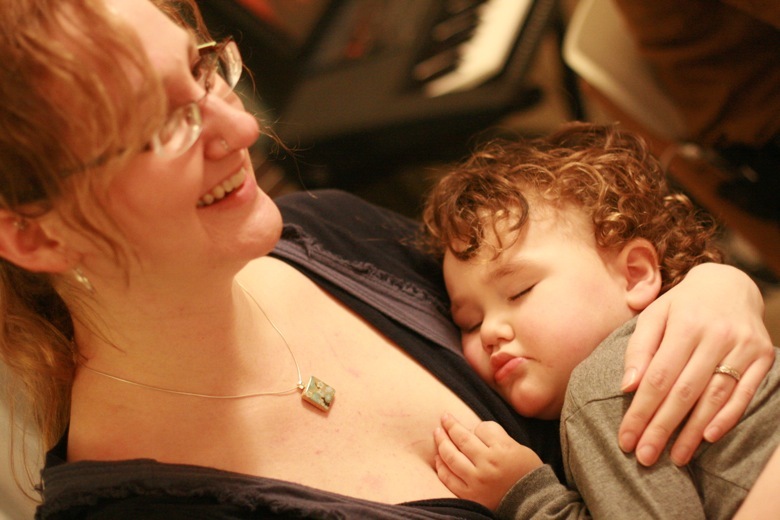 Your attachment parenting values might be undermined. If you're breastfeeding (or particularly, breastfeeding an older baby or toddler) in an environment where nursing is uncommon or even unwelcome, you might be asked to leave the room, cover up, or explain yourself. If you cosleep, your host might subtly encourage not doing so by offering separate rooms or separate mattresses. If you feel strongly that your newborn should be worn, someone might complain loudly that they never get to hold the baby when you're home and offer to buy you a stroller so they "get a turn" when you're out, even if you offer a comfortable baby sling and instructions on how to use it. If you practice elimination communication, you might get some sideways glances and raised eyebrows — or worse. With an older child, talking about your unschooling might lead relatives to suggest all the ways traditional schooling is so much superior. In a more passive-aggressive situation, as is my experience, you can just continue to do your thing and try to let the implied criticisms roll off your back. This can be especially hard when you're a new parent, but you'd feel worse if you changed your parenting just to suit their comfort levels. In a more straight-out aggressive situation, where you're told you are not allowed to do a particular thing in their house (e.g., breastfeed in public), that's a far stickier situation. You could choose to keep the peace in that moment and have a private discussion later about how you don't feel welcome and won't be returning unless they change their tune. Or you could continue your actions as they are and power through the tension, which might make the most sense if it's your own house (where your rules should take precedence). Neither's a perfect solution, so you'll have to see what you feel most comfortable with, personality-wise and taking in to account your child's age (is it something likely to make your child feel uncomfortable or threatened as well?). In a more neutral moment, you can try to find an ally to stick up for you (start with your co-parent, if you have one, and move on from there), and also talk honestly with your accuser about how you have chosen a certain path and would appreciate respect. If it's not forthcoming, you have to make the hard choice about whether to keep interacting with that person, for your children's sake. Your parenting choices may be questioned. Sometimes you'll receive questions from relatives about how or why you do the things you do. They can seem innocent but sometimes aren't. Someone once asked me why we had chosen to practice EC, and I tried to explain it, before the person cut me off to tell me that a friend of a friend of hers had tried it and her children hadn't potty trained any earlier. Ah. The lightbulb went on. This person had initiated the topic just to tell me that I had made a wrong decision, based on a faulty understanding of what our goals were for EC (in other words, early potty independence was not the point, in my mind). Other relatives of mine frequently do the same thing, where they'll ask a question just as a springboard to insert their own opinion. Once in awhile, I'll get a honest question from someone who really wants to understand, or even adopt the practice themselves — but they're so few and far between, I often don't recognize them the first time they're asked! My recommendation, when your parenting practices are questioned, is to be polite but wary. If a relative asks why you're still nursing after a year, they probably don't want a rundown of all the research you've done to show the benefits of long-term breastfeeding and the natural range of child-led weaning. If they do, a couple short responses ought to suss that out. You can say something neutral like, "It's still working for us," or something funny like, "We plan to nurse to college age — but her dorm will need to be a double," and see if the questioner's response is a genuine, continued curiosity or whether they launch into their prepared and uneducated monologue about how breastmilk has no value after a year, blah blah blah. If that's the case, you can use the "Pass the bean dip" style of communication, where you just repeat something neutral and then deflect the conversation, like "It's what works for our family. Please pass the bean dip." If you're feeling like a raging debate, you can always go for it, of course — you're unlikely to change the minds of people who are determined not to understand you, and you might upset yourself and your children with an argument. Then again, there have been cases where someone's mind has been changed through debate — maybe not even the person questioning, but a bystander who reconsiders some long-held beliefs. You'll have to decide what makes you most comfortable. After many cases of having my counterarguments ignored and dismissed, I've become a "pass the bean dip" type of gal with anyone who's not honestly interested in hearing my side. Traveling's bewildering enough for a little one, even before throwing strange people into the mix. who's forced to interact with any age I haven't yet experienced. These people will try but might misgauge the age level of the child, treating them as younger or older than they are. Often all it takes is a subtle redirection in the form of interacting with your child in an appropriate way. You might also act the part of a host bringing two guests together at a party by giving them a mutually interesting topic of conversation (particularly for an older child) or, for younger children, an activity they could perform together (such as putting together a puzzle you've brought with you or encouraging your artsy sister to draw an amusing animal). 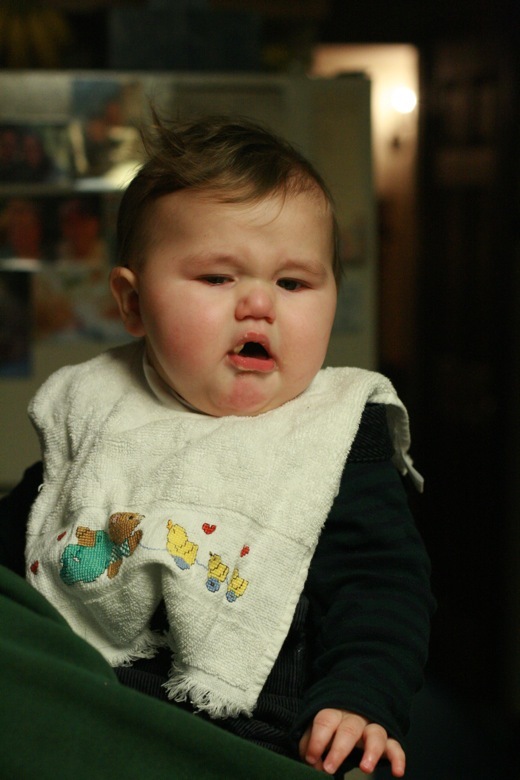 People who are dismissive of all children, including yours. They'll ignore your child or even say disrespectful things in front of him. This will sting a little, because by saying your child is unimportant, they are by extension implying you are unimportant since you (I figure) value your child. It also leaves you with less to talk about, since anything parenting-related is off limits for such people. I tend to be equally dismissive of these people and just try not to take it too personally. Often, they're people who have not had children (e.g., child-free friends, siblings, or cousins) or have not had the sole care of them in the past (e.g., grandfathers). The first category might change their tune if they end up becoming parents themselves. Now, I can see this being more hurtful in a situation where you really want your child to connect with this person (say, if it's a parent or dear friend) or if the dismissive behavior is hurting your child's feelings; in that case, you might try ways to get them to notice your child and for the two of them to interact in ways that benefit them both. 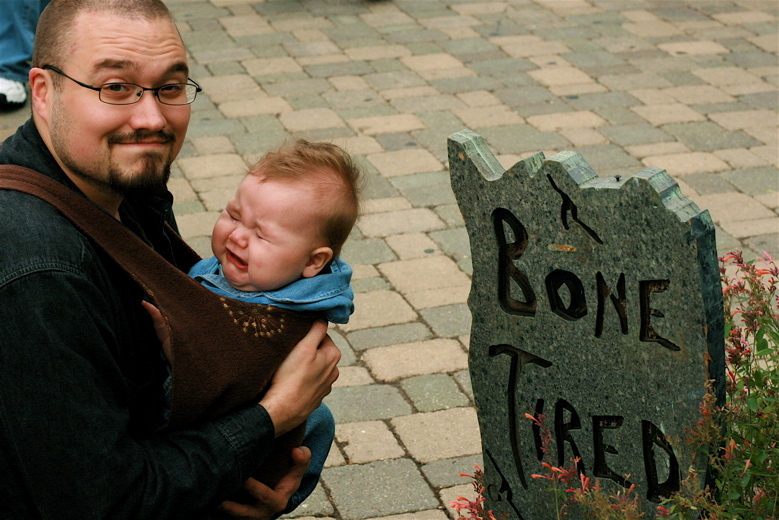 People who think they're great with children but…not so much. For me, this is a sort of grin-and-bear-it situation, because usually my child will make this distinction clear for them. Whether or not the adult picks up on it, of course, is chancy. One person we know who works with preschool children kept correcting Mikko's pronunciation: "No, kiel-bas-a." And Mikko would stare at him blankly and repeat it in his own mangled way. I know from child development study and my own experience with children that correcting a three-year-old's pronunciation is completely pointless; they think they are saying it the right way, and they will say it the right way in time. I don't usually try to enlighten people like this unless it's distressing Mikko. I usually just watch and wonder if the experiential lesson the adult is receiving will ever sink in. People who try to parent your child. These people tend to get my goat. They include grandparents as a matter of course but also uncles and aunts and other people who think their vested interest in your and your child's life is license for them to take over your parenting job. They think, since they've done it before or can see more clearly than you, that they know how to discipline, correct, or teach your child. They think they know what's best: what's best to eat, how best to behave, what phrases to parrot, what tone of voice to use. This is where I can't urge you strongly enough to stand strong in your position as the parent. It's hard for me, because I am also my parents' child and was taught to respect my elders — but I need to remember my job as my own child's advocate; if I don't stand up for him, who will? How do people who see him once or twice a year know better than his parents do what he needs or wants? Every time I haven't stood up for my child, I've regretted it, because it's an experience of failing his trust in me. It can be hard to speak up, to insist, to walk away, but your child needs to know you're there for him. It doesn't always have to be a confrontation — sometimes you can gently say, "This is how we do things in our family," and continue with your own way. Sometimes it will need to be a conversation you have away from your children, particularly with older children, so they're not pulled into the debate or made to feel responsible for the conflict. Sometimes it might cause hurt feelings in the other adults — but it's not your responsibility to parent them. Try to preserve the peace when you can; when you can't, err on the side of protecting those who are most vulnerable: your children. Keeping Mikko calm during a chaotic outing. Overall, we were happy we had traveled to visit our families, and we love to see Mikko interact with friends and relatives he doesn't see often. It's a challenge for all of us, and every vacation and family visit takes some recovery after the fact, but I think it's valuable for Mikko to meet the people who are important to us, and for all of us to learn ways of interacting with people who think differently from the way we do. The more Sam and I practice, the better we get at sticking to our values and standing up for our beliefs and, more importantly, our child. What bothers you most about interacting with friends and relatives who parent differently — or think you should? What are your tips for getting through with your smile intact? 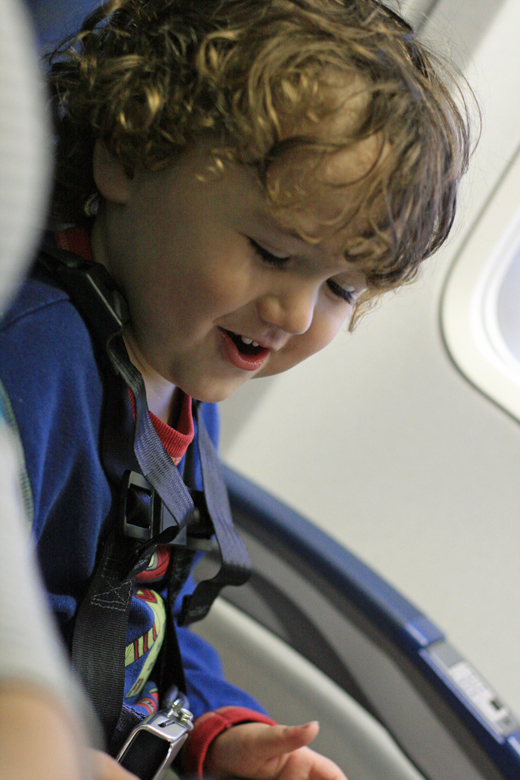 Be sure to check out my new review for the CARES Child Aviation Restraint System from Kids Fly Safe. 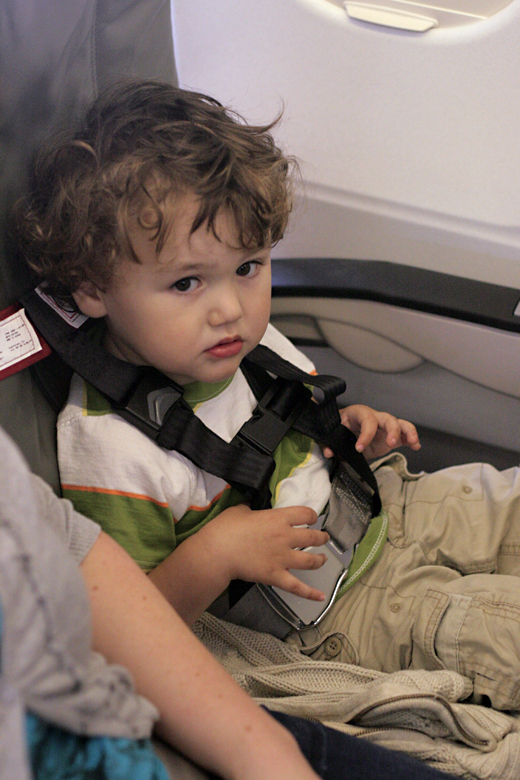 CARES is a unique, carry-on-friendly harness that will keep your child safe in an airline seatbelt sans bulky car seat. I have found that things have gotten much easier as my first child has gotten older. Now I have two kids, and one of them is a toilet-trained, weaned, kindergartner, who can dress herself and print her name and all that stuff. She's sort of a testament to my basic parenting abilities. These days, I have more confidence in myself, and other people have more respect for my parenting abilities. There are far fewer battles, and there's far more acceptance that our way is OK for us. This may not be terribly helpful, but it is good to know that the confrontations and challenges surrounding parenting in front of others do abate with time. Sometimes I wonder if family is one of the bigger reasons I want to hit the road. Most of my family is right here local and... ugh. My mother is very supportive of almost any parenting decisions I make, but then she kept insisting on giving me organic baby food. "Has Sasha tried that yet?" No, Mom. She hasn't tried it because she doesn't eat baby food. Then there is my dad's home... I find that I mostly avoid a topic altogether if I can. For instance, I have NOT told my dad of our intentions to unschool. He won't like it and may not even live long enough to see Sasha reach "school age." So why bother opening up an argument? Also, I wanted to thank you for talking about your loose schedule. Sometimes I feel a little guilty about not having a real bedtime routine, but I am just not that kind of person. It is reassuring to know someone else out there does things in a similar way. Thanks for sharing! We're visiting my in-laws, and while they are supportive of our parenting style, their house and the way they do things are just different. Gus and Jack aren't used to the changes yet. But it is a HUGE relief to me (and them, I'm sure) to have breastfeeding and bed-sharing as constants. They still nurse just the same, and they'll still be snuggled up in a big bed with daddy and me, so all is well for them. I am so glad to have gentle ways to help my little guys cope with the stress of holiday travel. Thanks for a comprehensive post with plenty of parental encouragement. Lots of mamas and papas will need it during the next couple of days! Thanks for writing about this, Lauren! Daniel and I are going on a trip next week and I've been nervous about these types of conflicts/confrontations coming up with family. This has helped me think more deeply about which things I want to stand my ground on if pushed, and which I'm willing to let slide. Family is such tricky business, isn't it?! great post as usual! I've run into many similar situations; family IS tricky business! So valuable, so important, so much potential for hurt. My father in law once volunteered to babysit my kids for an hour while I shopped for shoes for a wedding, and he spanked my then three year old while I was gone. I about died. Poor kidlet, he didn't deserve it at ALL (what kid does?) and then I'm left to confront my FIL about it (my hubby was halfway across the country for 6 months for work). YIKES! That sucked. I also had one of my hubby's cousins say, "After 6 months there's no more nutrition left in breastmilk, if you keep breastfeeding after that you're just doing it for yourself." This was AS I was breastfeeding my eight month old. A brief, "The world health organization recommends a minimum of two years. Why would they say that if there's no nutrition in the milk after six months?" Shut her up. "You said you would eat that whole apple if I gave it to you, and now you are not finishing it. That's lying! You told me a lie! You are a naughty boy for lying!" The apple is soft and slightly wrinkly. Can you blame him for not knowing that before he tasted your precious apple? Jeepers. She also likes to tell them theological fables: like, if you eat before you pray you will get sick. Or, if you misbehave while she's not watching God will see it and you will fall down and hurt yourself or be otherwise punished. Whenever kids hurt themselves she points out that they have probably recently sinned and God's making them obey. WTH? We're Christian parents, and that is bullsh*t. Pardon my language, but she gets my goat. I generally leave her place seething and swearing to myself I'll never go back. But you can't leave a 90 year old lady alone with no visitors, so back we go. It's an exercise in restraint for me. But I ALWAYS feel bad for not sticking up for my kids more at her place. You know what's weird? All of her kids (my hubby's aunts and uncles) are really nice people! Thank you so much for posting this! In two days we are going to a family reunion where half the family will be meeting my 8mo daughter for the first time, the other half will have seen her once at 2mo. It has always turned into yelling because no matter what answer I give my mom does not stop. I always have to leave/hang up or risk upsetting my daughter. She even says things like "you don't want to feed her pureed food because you want to starve her." She is vicious. The problem is I love my dad and he usually stays out of it, or he gently talks to me about whatever the concern is. And I want my daughter to have a relationship with Grandpa. On the other hand they also don't respect our decision to feed her only organic foods and they continually hint that they are going to give her candy or "what happens at grandma's house stays at grandma's house". My mom has already tried to undermine me in the past. I think she think's this is some sort of do-over for past mistakes with me. The whole reason I am parenting my daughter this way is to avoid the type of relationship I have with my mother. Your article was encouraging especially when you pointed out that despite others treating your child differently the parents way will win out because your child is with you the most. I would hate for my mom to undo all the hard work my husband and I have done and will do. 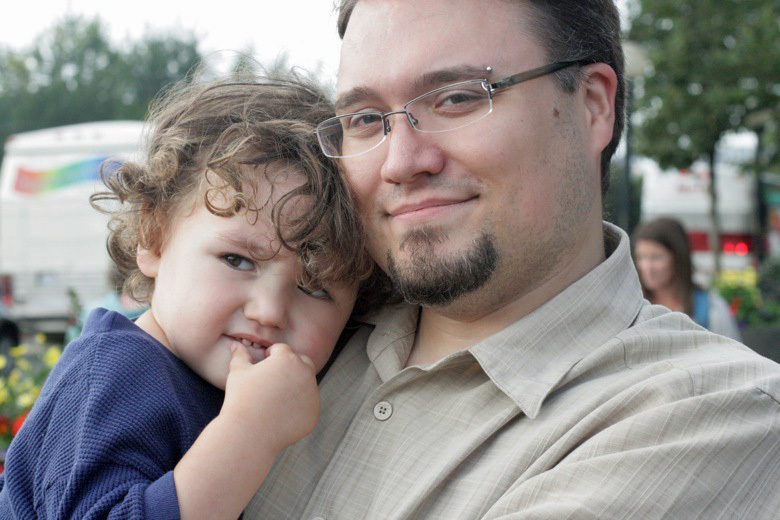 OK...how cute is Mikko....I just want to pinch the cheeks (gently, oc course!). Great tips and good for you for standing your ground. I have to do that often with my well-meaning parents. I did just about lose it this past weekend when my mother offered my 3 year old a chocolate-filled congnac-drenched dessert before bedtime and said "oh, you can't have it, Mommy said no." Really? Blame it on Mommy? You want to liquor her up before bed? And you were giving ME crap for not buying organic chicken?? Love it. Oh and generally when someone gives me unwanted or unnecessary advice I just smile and say "thanks, but I've kept her alive 3 years, she's bound to make it!" and walk away. I'm a grown woman and I do not need to explain myself. Oh good heavens I could relate to so much of this. I have grown to dread visits with my mother and sister because I know (a) my child will become a whole new person, (b) he will be judged for his behavior, and (c) I and my parenting will be judged. I SO need to master the 'pass the bean dip' type of responses because somehow I always end up reacting and blowing up at them at least once. Not pretty. My "favorite" family moment was when my brother and sister and law told my husband's brother's wife, who was pregnant, that if she wanted her baby to sleep at night, she shouldn't breast feed. Right in front of me, knowing I was nursing my 1 year old. They also love to give me advice about how to help my son sleep. Their son has been sleeping through the night since birth, practically, and they act like this is a manifestation of their virtue as parents. So annoying! Well. That banana-eating picture is just about the Best Thing Ever. I'm thankful that so far our families are very respectful of our parenting choices. The ony issue we have is that my parent smoke. When they visit us they smoke outside, but when we visit them? Well, we've only been there once since our daughter was born and we are still figuring that one out. The different behavour thing we see in our toddler, though. When it's new people or folks she doesn't see often she gets shy and clingy, but usually warms up a bit after a while. When it's her favorite babysitter and her family oh boy! She runs around completely manic yelling, dancing, crawling, rolling...it's really funny. This is such a great, thought-provoking post! I think the most helpful thing for me when I visited family with our daughter for the first time was sort of paving the way, by inserting little bits of info about how we do things in a nonchalant way before we left so no one would be too surprised. I was also honest with the people close to me (my sister, my mom) about my concerns, like the worry that our hosts would be uncomfortable with our co-sleeping in their homes. I think this was passed along and people were actually really sensitive. I see from your writing, and the comments that I'm pretty darn lucky in that regard! My grandmother, who I stayed with for ten days, actually rearranged her guest room to put the bed against the wall, and put a rail on one side and the other end to prevent babe from rolling out. It was so thoughtful! The hard thing for me was choosing what to comment on, and what to let slide off my back. As a first time mom, I'm not too good at letting things slide off my back, and I know there were hurt feelings. Heck, my feelings were hurt, too. This is an area where I'm really still learning and I hope to do much better next time we travel. I know your words will help! Thanks! Boy, do I ever feel lucky! Both of our parents share most of our parenting beliefs, and they also dealt with critical parents and in-laws, so they're uber-careful not to undermine or criticize our choices. It's a challenge for me not to be the spokesperson for AP wherever I go. So, I tend not to over-explain when I'm asked at these family events -- for fear of becoming "that person" who thinks they know what's best for everybody else's kids. When people ask, "How's he sleeping?" or "Have you given him applesauce yet?" I reply briefly and positively. For example: "How's he sleeping?" "Well, he doesn't sleep through the night yet, but since he sleeps with us, it's not really a problem." And then if they show disapproval/disbelief/etc., I say, "Yeah, I didn't think it would work either, but it's amazing how well we both sleep." Then the good ol' "pass the bean dip" segue. Luckily, whatever approach I'm taking seems to be working. We just got home yesterday from a big family trip and all we got is, "He's so smart/talented/friendly/happy, you must be doing the right thing!" My grandma-in-law truly believes he is such a "good" baby 100% because of what good parents we are. When I tell them how little my son cries, she says, "Ah, my boy cried all night, every night. It was the formula, it didn't agree with him. But back then, they all said it was the best. We know better now." Stuff like that ... telling me that I'm doing better than she did. I wish everyone else could have such nice family. All I have to worry about at these get-togethers is how hectic everything is, and how to make sure the kiddo gets his nap. oh man, babywearing leading to "let us have a turn" is so spot on and frustrating. also, my mother-in-love's favorite phrase is "you might be surpriiiiiiiised..."
no. i really, really won't. Oh man, THANK YOU for this. We have been going through an insane time with my MIL and our 9 week old. She also got upset when she found out I was block nursing to curb my oversupply and called me names and said she had never heard anything so stupid in her life. When we visited the week before Christmas, we had an all out battle after she tried to physically take my daughter from my arms after I had been nursing for over 10 minutes. On Christmas, she tried to take her out of my arms again when I was going to feed in another room, but it had only been 45 minutes since she had nursed before, so obviously that was an "issue". She obviously thinks our plans to try EC are ludicrous, has already given me several speeches about how we need to train her to sleep in her own bed and that we hold her too much, has said that I'm stupid for wearing her in the carrier around the house, etc. My husband is very distraught over the conflict between us because he had a very good relationship with her prior to this. I don't think he has been sure how to handle it, because his mother is VERY sensitive and has already called him crying numerous times over the fact that I haven't taken her advice. However, reading your reminder that it isn't our job to cater to the hurt feelings of the adult (but it is our job to protect our child and our relationship with her) helped him to see the situation and our priorities more clearly. I anticipate MANY, MANY more of these battles to come, and this encouragement to stick to our parenting choices and defend our relationship with our child in the face of conflict with other loved ones will prove to be invaluable. Oh goodness. I know *exactly* what you mean. My little guy is only 4 months old. We do EC and co-sleeping. I also put him down for naps AT HOME, but when we're traveling, the fact that he GETS sleep is way more important to me than where he sleeps, so I hold him until he's pretty solidly out--often 45 mins. My granny kept saying, "I hope his crib has arms built in." I just ignored her. The one who really got under my skin was my stepmom. She has a job working with teen moms and their babies, so she thinks she knows everything there is (you would think she invented infant sign language and reading to your baby). Every time I see her, she grills me about whether or not he's doing tummy time. Kid hates tummy time--HATES it--and also we babywear and generally carry him around A LOT. He can actually sit up on his BBLP without us holding him. (yes, we EC...my granny thinks we're traumatizing him, but anyone who sees him giggling and squealing while he sits on his potty has to admit that he seems to like it just fine). He has awesome head control and core strength. So he doesn't feel like rolling over. SO WHAT? She's convinced he's going to be developmentally delayed. The other one that was driving me crazy is that my mom and stepmom both insisted on trying to comfort my baby--who was overstimulated and just wanted mama. I know that grandmas are supposed to kiss your boo boos, but when you are three months old, you don't know that this strange lady is your grandma. He was wailing one night and I kept asking my stepmom to give him back to me. She said, "Babies need to cry sometimes. It's good for their lungs." I kept insisting that I do not believe that and that MY baby is not a big screamer. He cries when he needs something (in this case, to be held by someone familiar). I finally got him back by telling her he needed to nurse (he didn't, particularly, but he didn't refuse). My (conservative) MIL has really surprised me by being super supportive of breastfeeding on cue, EC (once she saw it in action), and my home birth. She told me that she didn't wean my husband until he was over 2, and that she wished she'd had her babies at home. So we get some support here and there. I realize that this post is pretty old, but someone just shared it on Facebook, which is how I came to read it. I absolutely loved reading this and just wanted to tip my hat to you for writing it. I will definitely be checking out more of your posts! Likewise, I didn't see this post until it was quite old, but I wish I had seen it sooner! I've been pretty lucky for the conflicts to be minimal (no shouting matches or battle of wills with inlaws) but I sure recognize a thing or two from your list! It's come to the point where I almost dread going to relatives, because I am one of those shy and introverted type of people myself, but the relatives are, well, they THRIVE on extroversion. 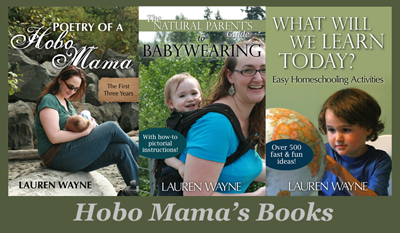 The two particular conflicts I have run into were the innocent question about babywearing into the "when is it my turn to hold her?" (which has now morphed into the wants-to-hold-her-the-instant-we-walk-in-the-door, even though she's shy and nervous and obviously not happy or willing), and pointed questions about baby-lead weaning from my own mother (who had previously been incredibly supportive of all my other strange parenting ideas, even to the point of researching and being an awesome doula at my unmedicated birth.) I was floored, and hurt. She just would NOT let it go, to the point of taking it upon herself every visit to feed the baby some babyfood or puree and pointedly say how much it looked like the baby loved it. I found that it was quite successful to have my husband "run block" for me, so to speak. Turns out he had a conversation with his mother behind my back after one particularly stressful and frustrating visit, and it was almost like night and day the next time we went. I was SHOCKED (not knowing his intervention) and she has been wonderful ever since, so that can really make a difference! (Though we're still working on the "let me hold baby" thing).